more detail of the MR big! Cool! I’m glad to see the Nostromo back in action after 30 years. 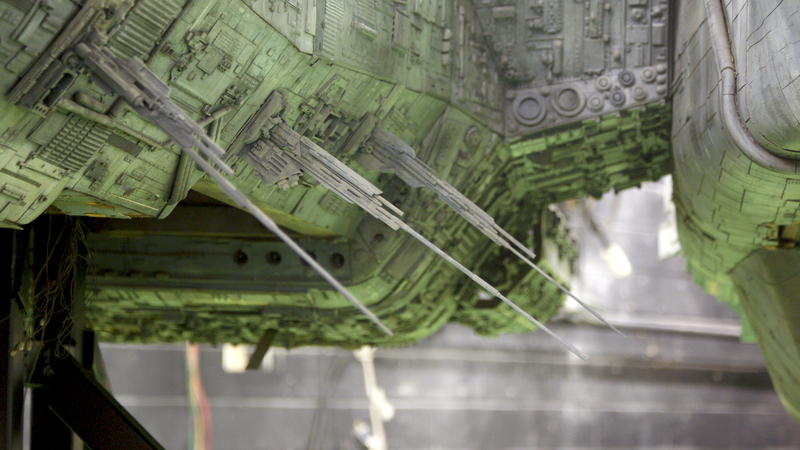 Is that “Y-Wing Cockpit” embedded in the side of Nostromo in the first picture? No,,, but good guess it’s an Apache helicopter canopy glass The actual cockpit module is over at the prop house of London and it will be reposition this Friday when the model is set up on display in their lobby!!! I also thought it was a Y-Wing until I looked at it more closely and realized that the shape isn’t quite right. Plus, this was 1978, Star Wars came out only a year earlier and I’m sure it took longer than that to construct this mammoth model. Ha! I thought that’s what that part was (Vader’s ship’s wing mount box thing). 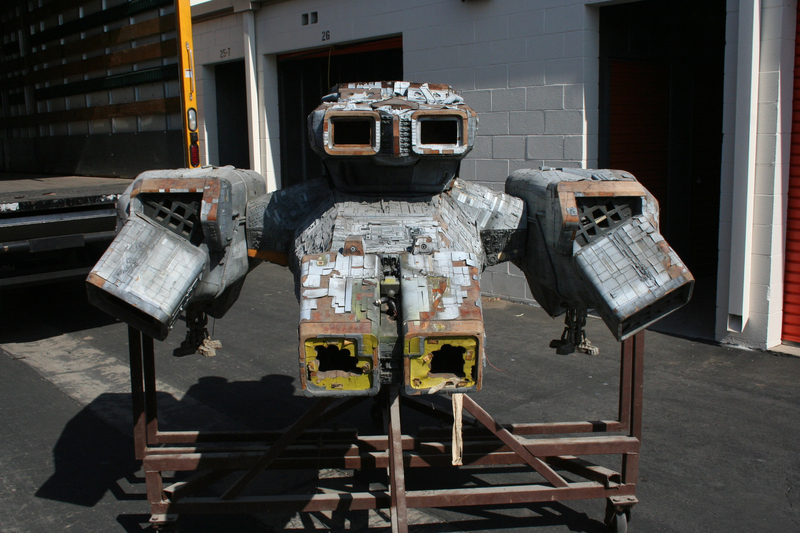 Hope you guys worked in an R2-D2 somewhere. Isn’t that a spaceship modeler’s in-joke? I had just watched the movie again a few days ago and never really gave the models much thought because the Giger Alien still blows me away. And I never really thought of this ship as a model. But what A great oportunaty(sp?) for you have a chance at her. She really is a great looking model. I watched a couple of times this year and the model work is just as incredible now as it was 30 years ago,,, Lots more appreciation for it now with all the pictures that have become available on the internet over the last couple of years!! What a passion and loving post! 🙂 I’m glad that you got to work on this fantastic model!! oh you lil scardycat!!! HAAA! you should challenge yourself to watch it tonight when its dark all by yourself with all the house lights off,,, I triple dog dare ya!! LOL that was how I saw it for the first time. It scared the Crap out me. I was hidden under the covers most of the film. but I was 12 then. It was not untill I was 15 that I could site down and watch it all the way though without hiding. Terminator was the same for me, but that was manly due to seeing the Endo. Stan and his boy did a great job on that one. Freak – 12 or 120 years old won’t make a difference for me…it’s just plain freakishly frightening! HA!! I’m amazed at the level of detail achieved on the model. Must have been really hard work to accomplish and yet really satisfying too. it is staggering when your next to it,,, we would detail a piece pretty heavily then standing next to the model you would often have to go back and add more stuff on top of the stuff you already did!! 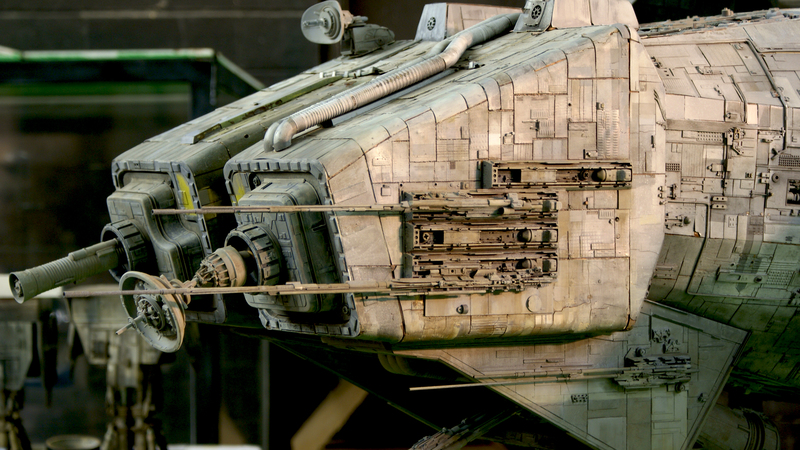 You know, it’s detailed close ups like this that makes me miss the model work that CGI has replaced. 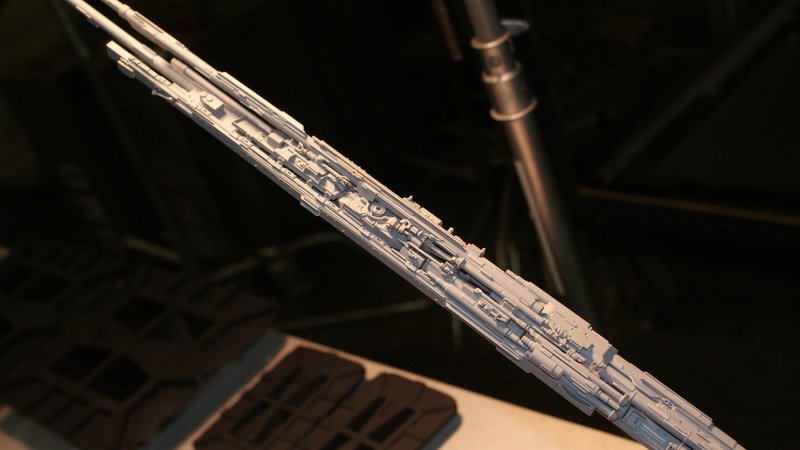 Sure, CGI models are good (the new Enterprise was a fine example of that) but theres something special about a hand crafted model thats been made with care and attention to detail. they are defiantly two very different worlds that are used to create the same results,,, I love both myself and equally just as much work goes into what your working on, the only difference is in the end you have something tangable to look at and touch with a practical model!! Amen bother, nothing like the tactile after-experience with a practical, eh. I know you said she was as big as a car, but I thought that was joke. this thing is massive. must have been a right pain to film. At least you got to help with restoring her back to full glory! no joke there it’s like working on a VW bug!!! HAAA! it’s heavy too!!!! steel and wood under structure and I’m sure it was a massive headache to work on stage!! So glad you got to lend a hand on her, eh. What an experience with model and movie history! wish you would of had your modeling pack on and been down here with me,, your bro too!! we could have modeled all day and Cheese burgered and choc shaked with some good movies all night!! Yeah we should all have a movie night in Kentucky!! you and Nelson goin’ to WonderFest this year, bud? Thanks for letting us see soem details of this ship. Are we gonna get to see the finished restored version? I knew the Cargo King of Chicago would like this one haaa! and yes there will be more photos coming! Ha ha. The Nostromo appeals to me on many levels. Ron Cobb designed it so thats always a winner. It s a freight hauler, tow vessel. Another plus. And its ugly in a cool way like the Millenuem Falcon. I also like the boxy unglamourous utilitarian shape to it. I’ll be looking forward to the finished pictures. thanks and my pleasure!!! The rods were done fast and you could easily spend another full day adding more stuff to them!! Any idea who the “private owner” is and if the model will be publicly displayed? Yes it’s going to be displayed in the prop store of London,, the LA California branch,, if the weather lets up here it could be up as early as this Friday!!! 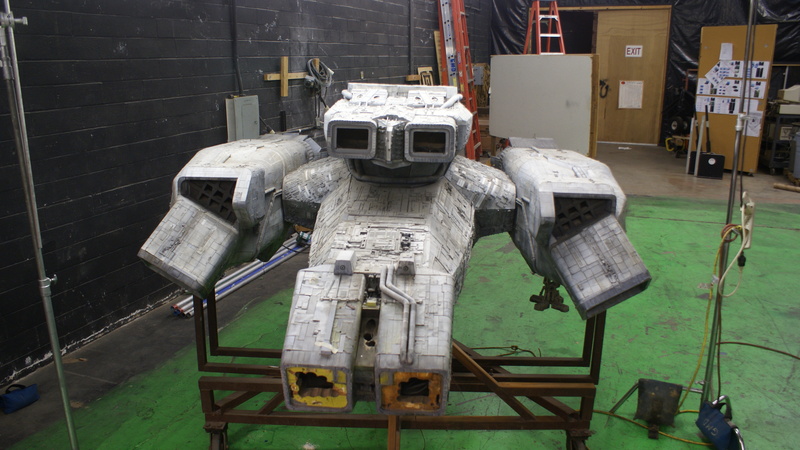 I spy an Imperial Walker “head” in the picture captioned “completed and in primer grey”. More fun than “Where’s Waldo” if you ask me. Very beautiful ship. Okay, I did not realize until the last post that it will be displayed in California. Is it going to be there awhile? Or is it going to get moved to London? I get out to LA regularly and would love to go see it. 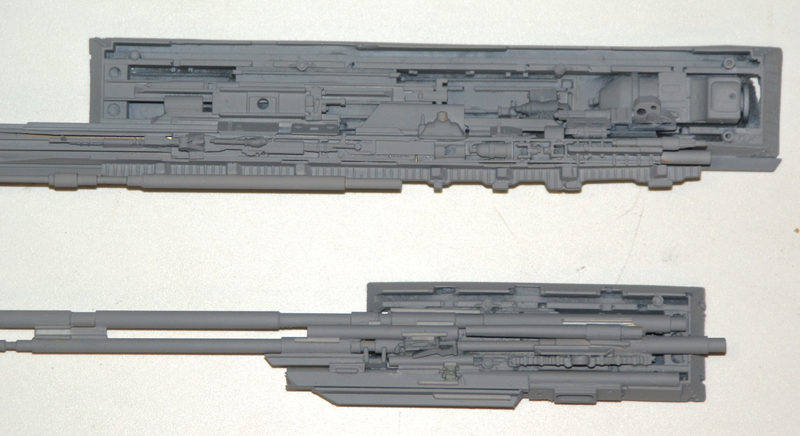 Also, when I saw a few pieces on display at San Diego Comic Con in July 2009, they had some explanation of what had happened to the model. Apparently it was stored outdoors for a number of years before being moved into a storage shed or something like that. Hey Dwayne,, yeah the model will be Conoga Park forever I think!!! anyways go to this link, and then at the bottom of the post are two links to some youtube’s that have a more complete story the Nostromo and her checkered past! Thanks. I presume that they filmed all of the effects in England. So how did the model end up all the way in California? It seems rather odd that it got shipped halfway around the world and then simply left outside for years and then stored in an uncontrolled environment for the remainder. It’s great that it’s finally been restored and will be on display somewhere. Good work. Wow that’s cool – I’m working not too far from Grants shop so I guess I am I can say I have been somewhat in the ships presence . . . That’s definitely one of my favorite ships. Soooo lucky you got to see and work on her . . .
where are you at!! Legacy??? Fox studios owned everything from the film and it was sent and stored at the lot or in one of their storage facilities!!! several years later a local movie collector named Bob Burns asked Fox if he could use some of the Alien stuff for one of his Halloween shows,, Fox agreed and Bob was allowed to use some of the props and fixtures. he took great care of the items loaned to him and Fox was impressed and liked how he had a museum built as a part of his home and how he cared for and displayed the many movie artifacts that he owned.. with that fox asked if he would like to be the care taker of the rest of all the Alien lot and he agreed,,, many large trucks came to his house and unloaded just about everything from the movie from props to models to alien pieces, sets etc. His house suddenly became a storage unit as well as the garage HAAA! Some time later some of his friends from KNB came by and saw the Nostromo and asked to take and restore it,, They took it and never got a chance to undertake the large restoration project mainly because they rarely to never have a free moment outside of all their movie work,,, so into storage it went and time and weather took it’s toll!!! so in brief there is the traveling Nostromo story!! I agree with what was said before about both physical and cgi modeling worlds being very different, but there is a real buzz in having a tangable object at the end to admire. VERRRY envious that you got to work on this “classic” John. And a Ron Cobb design to boot! !Thanks as always for sharing great pics and a great story. i felt the same way when i saw the other folks working on it!!! haa I was glad they got busy on other things HMMMM-Wahhhaaaaaaa!!!! Thanks for putting up these awesome pics! I love the Nostromo! I’ve loved Alien since I saw it as a kid. Always loved the designs. That’s what you get on a Ridley Scott movie. Any involvement from him on the restoration? 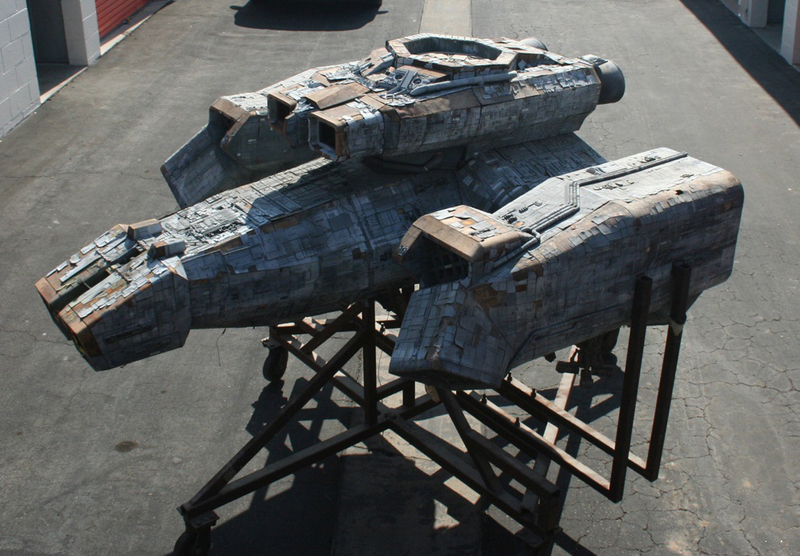 Gives me inspiration to start working on my own 4 ft long model for my own movie! Any tips? Materials? Scale? John- Tired to call ya the other night around 6 or so Texas time. I’ll try ya again this afternoon around the same time. 4 your time I think. Do I remember correctly, that one of the reasons why the special effects hold up so well in “Alien” was that model shot compositing was done in camera, instead of optical printing? I haven’t heard this but is plausible!! There is some roto work in the film, but a lot of it was done SPACE 1999/MOONRAKER style, where you double expose the stars into the parts of frame where the ship doesn’t overlap. The quality of ‘black space’ is a little bit variable in the movie at times, so you can kinda tell when they’re doing it. Johnson and Allder had a grid that went into the viewfinder or in front of the lens so they could chart off where the ship would be in frame, kind of BATTLESHIP style. What I never really understood was how Alien walked away with the Oscar for VFX over Star Trek – TMP. Other than politics . . . .
Maybe the weak shots in TMP were held against it? TMP has the best of the best of the best, but it also has some awful stuff in it. I would’ve been happy if it had gone to 1941 myself, which along with MOONRAKER and THE BLACK HOLE were the other noms that year. Truly awesome !! 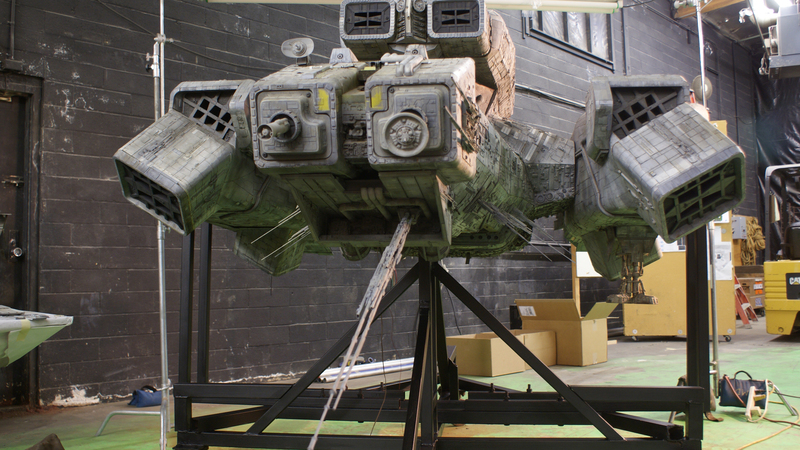 Love the Nostromo, fabulous photos, it should never have gotten into such a terrible state of disrepair in the first place though !!! The same thing kind of happened with the Telepods from David Cronenberg’s The Fly. He had them in his back yard for a while and tried to give them to Bob Burns but they were too big to fit into his house so he couldn’t take them. Now nobody knows what happened to them. They completley built new ones for The Fly 2. 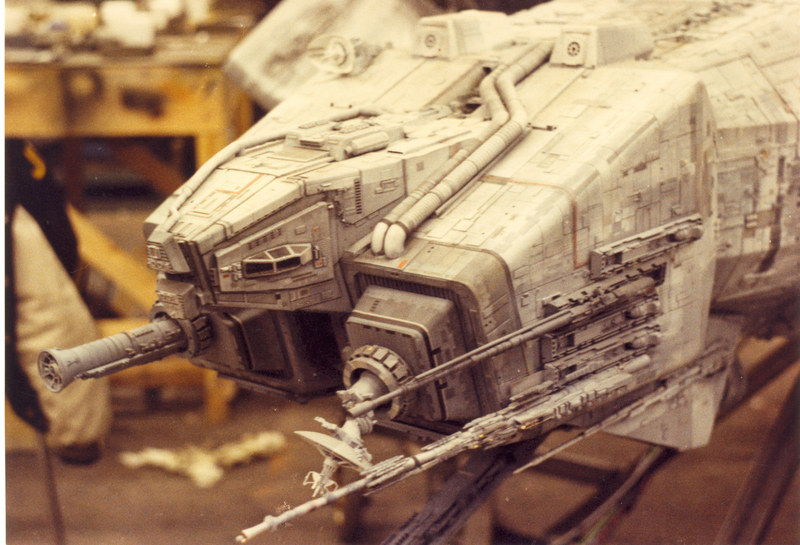 Thanks for showing this – it’s always nice to see classic movie props being given some proper care and attention. Do you know if it will be put onto a new display stand? It is going to stay on the original stand that it is on but the side mounts pull off so as to give you a nice unobstructed view of the ship from any side! Wow! You guys really made her shine again! Little Nip and Tuck model style, eh? 😀 I can only imagine that it’s a little surreal to be able to work on these things that you saw in the theaters and admired from that magial theater that transported you light years away. You guys did an awesome job just from observing photos! 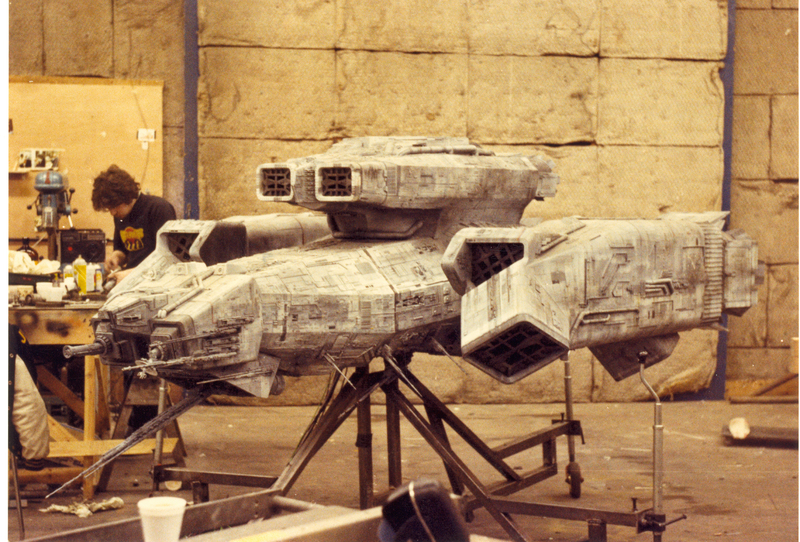 I don’t understand why Supervising Model Maker Martin Bower wasn’t approached for the “Nostromo” refurbishment. 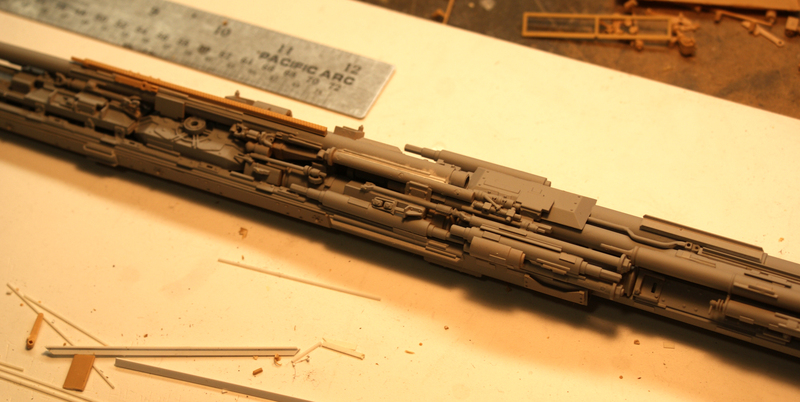 He is still making models on commission. i believe it was because the model was here in the states and he was in the UK!!! I am not sure what the refurbishing costs were set at but that would have been great if he could have! I hope you remenber my name from the days at Boss film studios. A friend send me a link to this page cause he knows that I used to work in miniatures. Anyway I became aware how sucessful you got as a designer for Star Trek, I worked on the video game “Star Trek Armada” for Activision, and we had a referece book with designs for the movies and your name was there on the cover. This was a pleasure to see! 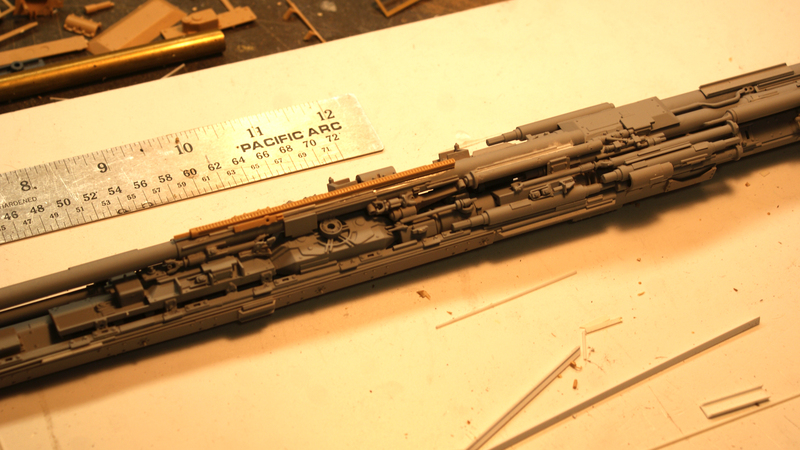 I love these ships with details cobbled together out of model kit pieces. It was always fun for me to try and identify where the parts came from. The one that made me laugh on this model is the Star Wars Snow Walker Head in the image labeled “Completed and in primer grey” So thank you for sharing this. It’s an awesome model.